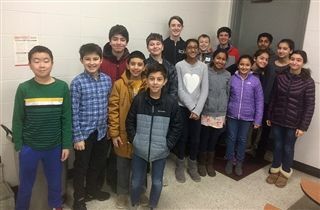 Congratulations to the KCD MathCounts team, who finished as regional runners-up at the MathCounts regional competition on February 16. Sixteen KCD students competed against 200 other students from 30 middle schools in the surrounding area. Congratulations to Emaan Sayied, Daniel Bronfman, Evan Davis, Hugh Kuffner, and Natalie Hayden for finishing in the top 25 in the region and to the four-person KCD team of Armaan Rai, Aryan Agahtehrani, Daniel Bronfman, and Emaan Sayied for earning trophies for placing second in the competition! The KCD MathCounts team will compete on March 23 in the state championship. The team has qualified for state for eight years in a row and placed fifth last year.